Who is Mike Mignola ? 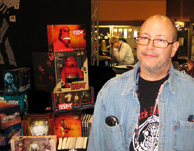 Mike Mignola was born in 1960 in California. He graduated from the California College of Arts and Crafts in 1982. Mike moved to New York city and started as an inker for Marvel Comics, then as artist on Rocket Racoon and the Hulk. He is the creator of the series Hellboy which started in 1994, a huge publishing success, which eventually became a movie directed by Guillermo del Toro. Mike Mignola was given the sketchbook during the Comicon festival, and probably didn't realise that he was doing a drawing for this project. It is a cool simple drawing which reminds the talent of Mister Mignola.